Thanks to its recently announced partnership with Island Health and the Ministry of Health, Providence Residential & Community Care (PRCC) Services Society is one step closer to achieving its vision of developing a dementia village in Comox on Vancouver Island. The proposed Comox dementia village will be separate from, and in addition to, the one announced last February for Heather Street in Vancouver. The Comox dementia village will be constructed at the site of the existing St. Joseph’s Hospital. The 17-acre site that overlooks the ocean is currently home to The Views, a residential care home, and the former St. Joseph’s General acute care hospital that was vacated with the opening of the new North Island Hospital. Official transfer of ownership and operations of the 117-bed care home and four hospice beds to PRCC will take place this spring. 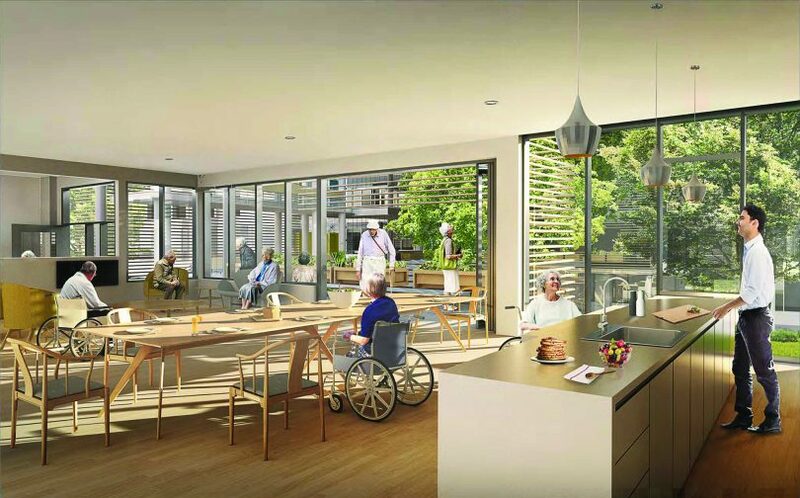 The Dutch model for seniors care – known as the dementia village in De Hogeweyk, Netherlands – will serve as the vision for the dementia village at St. Joseph’s/The Views in Comox as it will for the Heather Street site in Vancouver. PRCC is a new entity created by Providence Health Care to support and enable their future vision for seniors’ services, including the renewal of their residential care homes. “Providence Residential and Community Care is grateful to Island Health and the Ministry of Health for giving us additional beds at St. Joseph’s Hospital, allowing us capacity to create a dementia village. With this expansion to Vancouver Island, PRCC has taken the next step to fulfilling its mandate to become a leader in seniors care, which other health care organizations and jurisdictions may eventually emulate,” said Jo-Ann Tait, Providence corporate director, seniors care and palliative services. The Comox dementia village will provide care and treatment for people with dementia through a variety of means. Upholding the spirit of compassion of the founding Catholic Sisters, Providence looks after some of Vancouver’s most vulnerable populations in its residential care homes, and PRCC will ensure it continues to do so at its envisioned dementia villages. PRCC aspires to build a community in Comox with various levels of housing and care options that support seniors, and their spouses and partners, to age in place on a single campus – ranging from independent living, long-term care and specialized dementia care and neighbourhoods. The Comox dementia village will feature many aspects of the Dutch model such as smaller households for residents who share a common bond with each other. The entire perimeter is expected to be secured using creative structure and technology so that residents can easily venture outside as much as they like. PRCC’s goal is to create vibrancy and an authentic sense of community with amenities that are actual destinations and points of interest for people and their families to enjoy, including a grocery store, pub, and music room. Research has shown that person-centred dementia care not only optimizes quality of life for people with dementia, it can actually foster positive outcomes for people afflicted by a disease normally steeped in fear and confusion. The Comox dementia village is only one component of an entire master site plan with specifics to be determined going forward. PRCC will identify those needs through engagement, consultation, and working closely with stakeholders, partners and the community. In addition to the dementia village, there are opportunities to build and provide numerous other services and programs on the campus to meet local, community and regional needs. These services may include more housing solutions, respite care, bathing and meal programs, primary care services, youth services, and Indigenous health services. Comox has a critical need for seniors’ services now which is expected to increase over the next two decades. Alzheimer’s and dementia patients present the most urgent housing and care needs. In 15 years, the number of Canadians living with dementia is expected to nearly double, making the development of dementia villages like the ones planned for St. Joseph’s in Comox and Heather Street in Vancouver more important than ever. Established in 2017, PRCC has its own society and board members who are steering the continuing planning and engagement work to achieve key milestones required in the coming year. The Views at St. Joseph’s is a Catholic health care organization previously owned and operated by the Bishop of Victoria. PRCC’s ownership of The Views will mean its staff will become PRCC employees and medical staff will be privileged through PRCC as of April 1, 2019. To view the Ministry of Health announcement, go to: https://news.gov.bc.ca/releases/2019HLTH0009-000040. Subscribe here for weekly stories. Please choose your area of interest.